In this tutorial, the user will learn how to create a flow that automatically opens a ticket in Zendesk if the temperature of the refrigerator is too high. First create a Microsoft Flow Tago connector if you still haven`t created one. You can follow this tutorial to learn how to do it. On the Tago admin, create a device called thermostat, and a dashboard called Flow. On the dashboard, add an input, select the bucket thermotat, the device thermostat and the variable temperature. This input will simulate your device`s thermostat. Now, add a gauge with the same bucket, device and variable, and you will have a dashboard like the one in the image below. 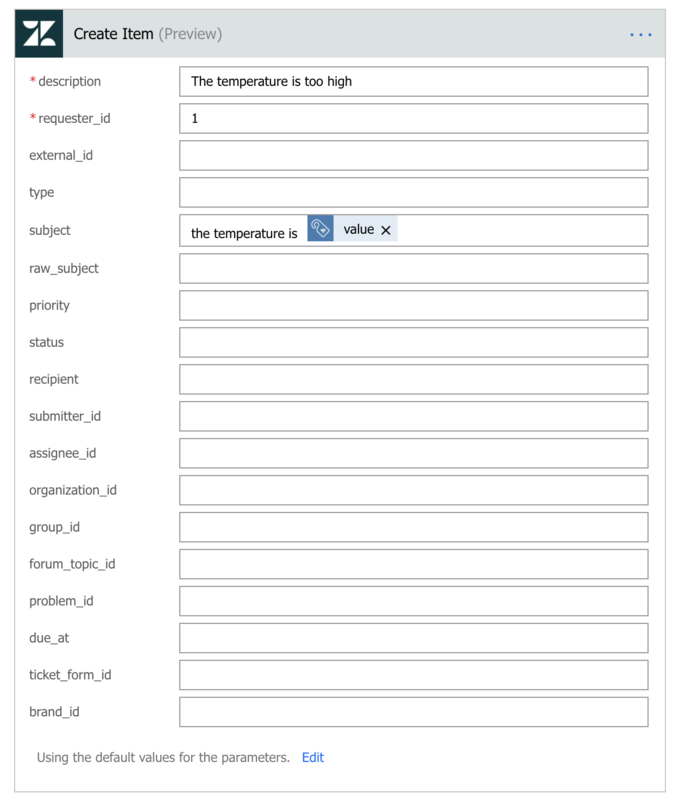 Type some value in the input and send, this will create the variable temperature inside your bucket. Now, go to flow.microsoft.com, log in and go to the section templates. On the search area type Tago. You have the tago connector, as described in the begining of the tutorial, now you need to create the Zendesk connector. Click on sign in for the Zendesk account. When you have signed in, click continue. If you want extra information in the Zendesk ticket, feel free to fill the form. Now click on Save Flow and done. If you go to your dashboard and send a temperature greater than 37, this flow will open a ticket in Zendesk telling you that the temperature is too high.